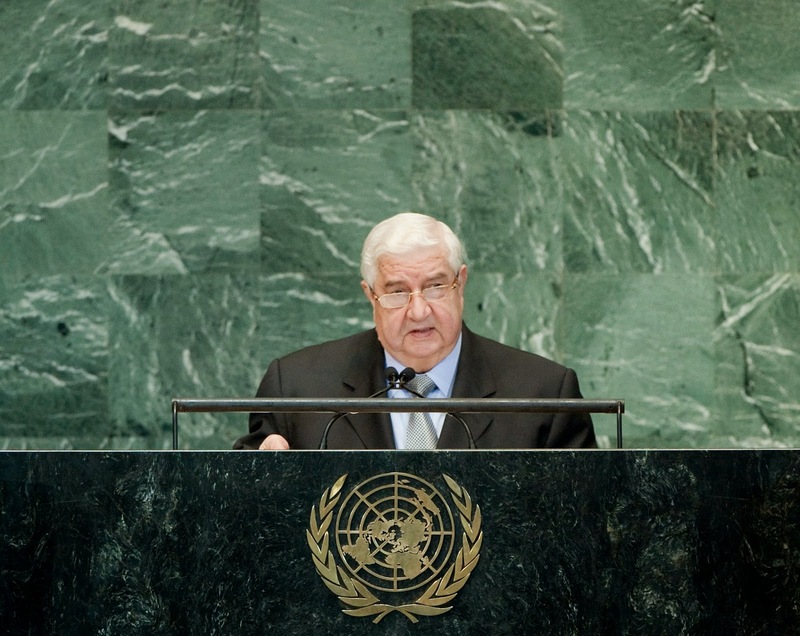 Syria’s Foreign Minister Walid al-Moallem said today his government is “satisfied” with the U.S.-led bombing campaign against the Islamic State. He made the remarks during an interview with the Associated Press. Moallem said that the U.S. does not inform Syria of every strike before it happens. He added, “But it’s OK.” He said that Syria heard from the United States 24 hours before it led the initial airstrikes last week. Moallem’s remarks contradicted the Iranian and Russian opposition to the U.S. air campaign in Syria. Iranian President Hassan Rouhani called the airstrikes illegal during a speech at the UN General Assembly earlier this week. The Iranians could be concerned about a possible warming up of relations between Assad’s government and the U.S. at their own expense. Moallem suggested that al-Nusra and other extremist Islamist groups should also be hit. No offence sir but that last part about warming of relations between Assad and the West at Iran's expense is a bit too imaginative! "IRan concerned about a possible warming up of relations between Assad’s government and the U.S."
You have got to be kidding. Assad would have been hung by by the neck by now if it wasnt for iran. Do you really think, Assad is about to switch sides? Moallem's satisfaction is about as worthless as Iran's disapproval. neither one is worth spit. I agree with the above comments in that I see no connection between the Syrian Arab Republic qualified approval of foreign airstrikes targeting Jihadist forces in Syria, and Iran's position on the matter. One must bear in mind that the Iranian, Russian, Chinese position (and others) on the matter is in reference to the UN charter and the need for a UNSC resolution sanctioning war. The only reason that there is no potential UNSC resolution on war in Syria is due to the above mentioned nations' position that the Syrian Arab Republic be included as part of the coalition fighting ISIL --not in any way related to concerns of possible SAR rapprochement with the U.S. I really don't believe Iran's opposition to U.S.-led campaign in Syria has much to do with a lack of UNSC resolution. Iran did not oppose Russian annexation of Crimea and its involvement in Ukraine because there were no UNSC resolutions, and more importantly it did not oppose air campaign in Iraq, although it too did not have a UNSC backing. The Iranian argument against the Syrian campaign, with Rouhani calling it illegal, was the lack of Syrian government approval. Moallem tells us now that the Syrians knew about the airstrikes in advance, and believe it's not a bad idea. I have no idea what's going on behind the scene. But a rapprochement between Damascus and Washington caused by both sides fighting against ISIL could, and the operating word is could, upset Iran's geopolitical calculations. You guys are saying there is absolutely no way that such a thing happens, and you are very sure about it. As I am not as certain as you are about what will happen in that region next, I defer to you until the events on the ground prove us wrong.